For our second guest short story, Nicole Zoltack has given us her leprechaun story, "Too Much Luck." Enjoy! Diana Smithson was the luckiest girl ever. Her golden hair was never out of place, the boys all fawned over her, and she didn't have to study to get straight A's. In short, she was perfect. But being lucky didn't prevent her from tripping over a rock and rolling down a soft grassy hill. Diana brushed the dirt from her knees and started to stand when she saw it. She laughed and plucked the four-leaf clover. She twirled it in her hands. Diana almost dropped the clover as she whirled around. "Who are you?" A tall clean-shaven man wearing red clothes approached her. His hands were stuffed into his pants. He chuckled, and his belly juggled, reminding Diana of Santa, not that she believed in the jolly old elf. "I live down that a-way," the man said, nodding toward a small nearby cottage. "What are you doin' on me land?" Diana smiled charmingly. "I was just going for a walk." Diana's parents had finally relented, and Diana had been spending the past month studying abroad in Ireland. She would be here for a few more months yet. Bess, her roommate, had a class now, so Diana had ventured outdoors by herself. She backed up slightly. "I'll be on my way now." Diana opened her eyes wide. "Excuse me?" "You've taken something from me, and I want it back." "But I haven't--" Diana remembered the clover in her hand. "Fine. 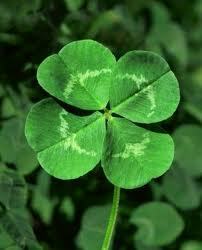 Here's your clover." The man snatched it back. A green light shimmered around him, and he shortened before her eyes, and a reddish beard grew on his face. Diana gasped. "Are you a--"
"Leprechaun?" He sighed. "Do you know how many times I've been asked that?" "But you're so short! And your beard." Diana had never believed in magic but now she wasn't so sure. She did believe in luck though, so it only made sense that she would happen upon a creature know for it. Diana was careful to keep her eyes on the leprechaun. She wasn't about to let him out of her sight. It hadn't rained for days, so there were no rainbows nearby. Where else could his treasure be hidden? "I see that look in your eye," he grumbled. "I won't be tellin' you anything. Now get off me land!" Diana hesitated. The thought of a pot of gold was tempting, almost too tempting. But she thought she remembered that leprechauns were mischievous creatures, some even belligerent. She wasn't about to find out if one could be malicious too, and this little man, though he was comical as he hopped from foot to foot, looked ready to foam at the mouth. "Fine, I'll go." The short man narrowed his beady eyes. "Just like that." Diana nodded. "Yes. I'm sorry if I caused you any trouble." She turned around and started back toward Bess' house. A hand on her shoulder startled Diana. She had assumed the leprechaun would disappear as soon as she had looked away, but he stood beside her. His eyes widen, first with alarm then great delight. "You've finally returned!" he cheered. "Excuse me? I've never been here before, I'm from America and--"
The leprechaun danced a jig, still holding onto her. "You be one of the daughters of Fortuna." "You must be mistaken." Diana jerked her arm back. "My mom's name is Rose. I don't know any Fortuna." "Fortuna. The goddess of fortune." Diana could feel the blood drain from her face. Maybe that was why she seemed to live a charmed life, why she was always so lucky. And maybe she hadn't fallen down that hill by accident after all. "No." Diana shook her head. "This is all a dream. I'll wake up in my too small bed back in Bess' house any second now." Diana closed her eyes and tried to will herself awake. Instead of seeing the house, or even green hills for that matter, Diana saw clouds. "Where am I?" Diana called out. "It is time, my daughter." The voice sounded within Diana's head, but no one else was there. Not even the leprechaun. "I just want to go home," Diana said desperately. Diana woke up then. She rolled over and stretched. A dream. It had all been a dream. She opened her mouth to call out to Bess when she noticed something on her dresser. That melodious voice she had heard in that cloud place had said it was time, but for what, Diana didn't know. Suddenly, she didn't feel so lucky after all. Very neat story! I like how it leaves you thinking in the end. Love it. Very fun story.